On your e-commerce site, Kredivo Checkout let your customers finalize their purchase by providing their phone number and password. As for offline transaction, customers only need to scan QR code on their Kredivo mobile app and finish the transaction on the app. Kredivo Checkout adapts seamlessly to both desktops and mobile devices. This means that you instantly get the same conversion on mobiles as on desktops. One-click buying increases conversion by an additional 29% for returning customers. Kredivo assumes all risk for both the customer and merchant. That means no more charge-backs for you as a merchant. We have set up a demo checkout so that you can try it out yourself, just go to one of our partner sites. In order to complete the Kredivo Checkout integration process as simply and quickly as possible, we recommend that you start by setting up the following. Both the checkout page and the checkout confirmation page are hosted by you. Both these pages must include a div that you will populate with the Kredivo Checkout button. You will learn what the Kredivo Checkout is in our first tutorial, embed the checkout. Kredivo Checkout is responsive, which means that it will always use the full width of the container. Tip! Place the Kredivo Checkout button so that your customers can see it instantly after loading the checkout page without scrolling. Provide clear calls to action to improve your conversion rates, such as “Finalize your purchase now”. An example of what the checkout looks like on different devices. As you will learn in the Confirm purchase tutorial, Kredivo needs a URI to inform you of the order status. You will need to include a placeholder in the push URI, which Kredivo will then replace with the order URI when we send the push request. If you need any help with the documentation and sandbox environment, please email support@kredivo.com and we’ll respond as soon as we can. If you do not already have a merchant account, please email support@kredivo.com to get setup with one. Does Kredivo work on desktop and mobile? Yes, desktop, mobile, and tablet web. You’ll need a server_key to interact with the Kredivo’s server. Please send an email to merchops@finaccel.co to sign up as an Kredivo merchant and get server_key. Kredivo provides two very straightforward checkout methods for you. This checkout method works for your e-commerce site. By using this checkout method, your customer will only need to input their mobile number and PIN, then finalize the purchase by inputting OTP. You can learn more about Kredivo 2-click checkout API here. This is how Kredivo 2-click checkout works. This checkout method enables your customer to purchase from your offline store using their Kredivo limit. Our API will give you the QR code which will be displayed on your POS device. Your customer will then scan that QR code and they can finalize their payment on their Kredivo mobile app. You can learn more about Kredivo QR checkout API here. This is how Kredivo QR checkout works. Tokenization is a feature that allows Kredivo users to tokenize their Kredivo account inside the merchant’s platform. A tokenized user will then be able enjoy our express checkout feature. Whereas our regular checkout requires the user to enter his/her phone number, PIN, and OTP to confirm the transaction, the express checkout will essentially allow the user to checkout without entering anything. In the case where our security system flags a transaction as suspicious, we will throw an OTP challenge to the user. Our tokenization feature, along with the express checkout capability, is a great leap forward even when compared to our already smooth 2-click regular checkout. It is the smoothest checkout process in the market today, giving unparalleled user experience. This tokenization feature is only be available for selected merchants. Contact us if you’re interested in using this feature. To initiate 2-click checkout with Kredivo, you will need to call checkout_url API. server_key String Required. Each merchant will have server_key generated by Kredivo. tokenize_user Boolean Optional, default value is false. Set this to True if you want to tokenize the user. You will get user_token when the transaction status is settled. user_token String Optional. If user_token is set, this will be used to authenticate user. back_to_store_uri String Required. URI of your store page. Used on the settlement page. Kredivo’s server will pass some params to this uri for merchant’s server acknowledgement: order_id: Order Id given by Merchant; tr_id: Transaction Id given by Kredivo;tr_status: Transaction status of a transaction; sign_key: Signature key to validate if the notification is originated from Kredivo. Please contact us how to parse this signature_key by using your client key. expiration_time String (epoch) Optional. by default kredivo set expiration time 24 hours after transaction time. redirect_url String Redirect URL will be sent for regular transaction. If the user has been authenticated, there will be 2 scenarios: If our security system flags the transaction, we will pass a redirect URL that contains an OTP challenge for the user. Otherwise, we will not pass any redirect URL and you will only need to wait for a callback from Kredivo. id String Required. Can be product SKU. Important! for item fee such as: shipping fee, admin fee etc. you have to use this id: shippingfee, adminfee, taxfee, discount, additionalfee, insurancefee, mixpayment. type String Required. Product category. This is optional step if you want to display list of eligible payment type and implement Installment on your page to calculate and display Installment breakdown on your checkout page. payments Payment List of available payment type to the transaction including its breakdown. You can find available payment type here. amount Double Transaction amount. Total purchased items. In this tutorial you will learn how to confirm that you have received and created an order in your system. This confirmation is needed in response to a push notification from Kredivo, indicating that the consumer has completed a purchase. Once you have received the push notification you should update the status of the order. Once a consumer has completed a purchase, Kredivo will inform you via a POST request. The POST request will be made to the push notification URI you provided when you created the checkout order. "location_details": "Jl. Kerinci IX No. 5-A"
signature_key String Signature key to validate if the notification is originated from Kredivo. Please contact us how to parse this signature_key by using your client key. "message":"Message from merchant if any"
Its expected for merchant to send below response when merchant’s server already received the notification from Kredivo’s server. status String Status code (OK or ERROR). user_token String Once the user authentication succeeds, we will send you the user token. Use this token to enable the express checkout for the user. Currently the user token has no expiration. You should now settle the order in your system with the order data that you want to store if transaction_status is SETTLEMENT. Payment can be voided with cancel method if transaction has been completed. ** A transaction can be cancelled within 30 calendar days after the transaction was created. If a cancellation is requested after 14 calendar days, we will charge cancellation fee to merchant. We would not be able to cancel a transaction after 30 calendar days. cancellation_amount String Optional. If you don’t pass this parameter or if you pass a cancellation amount that is equal to the transaction amount, it will be treated as a full cancellation. If the cancellation amount passed is less than the transaction amount, it will be treated as a partial cancellation. If the cancellation amount is bigger than the transaction amount or a 0 or a negative number, we will return an error. Transaction status String Transaction status of a transaction. when there is remaining amount(partial cancellation), transaction status will be stay in settlement. and for full cancellation, transaction status will be cancel. fraud_status String Detection result by Fraud Detection System (FDS), the values is:accept: Approved by FDS deny: Denied by FDS. You can use this API to check individual transaction’s status on Kredivo. You can refer to this chart to see Kredivo’s transaction status flow. Fraud status String Detection result by Fraud Detection System (FDS), the values is:accept: Approved by FDS deny: Denied by FDS. Transaction id String Transaction Id given by Kredivo. user_token string user_token sent from Kredivo to tokenize the user. is_active boolean True/False. If False, Kredivo is not able to provide User Credit Details. Using this api, you can check remaining transaction this aim to help decrease deny order from inssuficient limit. user_token string Mandatory. user_token sent from Kredivo to tokenize the user. user_details object detail of user . This API will enable your users to connect their Kredivo account to your application. client_user_key String Required. Should be unique per user on client side. Once tokenization successful, Kredivo will inform you via a POST request to your callback_uri. user_token String key to tokenize the user. cliet_user_key String user identifier, send by merchant. QR Checkout is a Kredivo payment method that you can implement on your POS. By using this method, you can allow your customer to pay using their Kredivo limit on your offline store. You will need to obtain server key to interact with Kredivo server. Please send an email to merchops@finaccel.co to sign up as an Kredivo merchant and get server_key. To initiate QR checkout with Kredivo, you will need to init_checkout API. type String Optional. Product category. Once your customer is done processing the transaction on their side, you will need to call check transaction status API. transaction_id String Required. Transaction ID given by Kredivo. cancellation_amount Integer Optional. If you don’t pass this parameter or if you pass a cancellation amount that is equal to the transaction amount, it will be treated as a full cancellation. If the cancellation amount passed is less than the transaction amount, it will be treated as a partial cancellation. If the cancellation amount is bigger than the transaction amount or a 0 or a negative number, we will return an error. We provide plugins for e-commerce site running on certain platforms to make it easier to integrate with Kredivo. Below are plugins for some supported platforms. Using Kredivo’s logotype generates trust and increases your conversion. Depending on if you have dark or light background you can get either a blue or white logo. We recommend that the Kredivo logo displayed at your site is between 100-300 px. Note that you should not add px after the size parameter. When showing the different payment alternatives you offer in your store, display our one and only logo. When hovering over the logo shows details on the payment methods available in your store. You will increase the conversion for high value products by showing your consumers that they have the ability to pay in installments. Always use our logotype on product level. The logotype is highly recognisable, even in small sizes. For optimal conversion use our payment method widget. Kredivo team is here to work together with you to identify and solve problems, support and build a long-term mutual relationship, as well as create collaborative campaigns to increase your revenue. Why is this important to implement Merchant Best Practices? Incremental sales takes time and effort. Acquiring customer that is loyal require time and effort. Kredivo is here to facilitate the process through Merchant Best Practice. Education is crucial. Instant credit financing is not a familiar concept with many consumers. It is important for merchant to educate and create a good consumer flow within the platform. Sales enabler engine. “Buy now pay later” and “Installment without credit card” is a very strong message for consumptive consumers, allowing them to buy more and more often. Sharing this messages within the platform clearly will help increase sales. Please send all Kredivo related collateral (newsletter, product promotion, social media posting, banner, FAQ) to successops@finaccel.co prior to posting for approval. For any merchant related inquiries on customer service and payment information please send it to merchant.help@kredivo.com. (Note: this is for merchant related inquiries not consumers related inquiries, in any circumstances this email shall not be given to consumers). 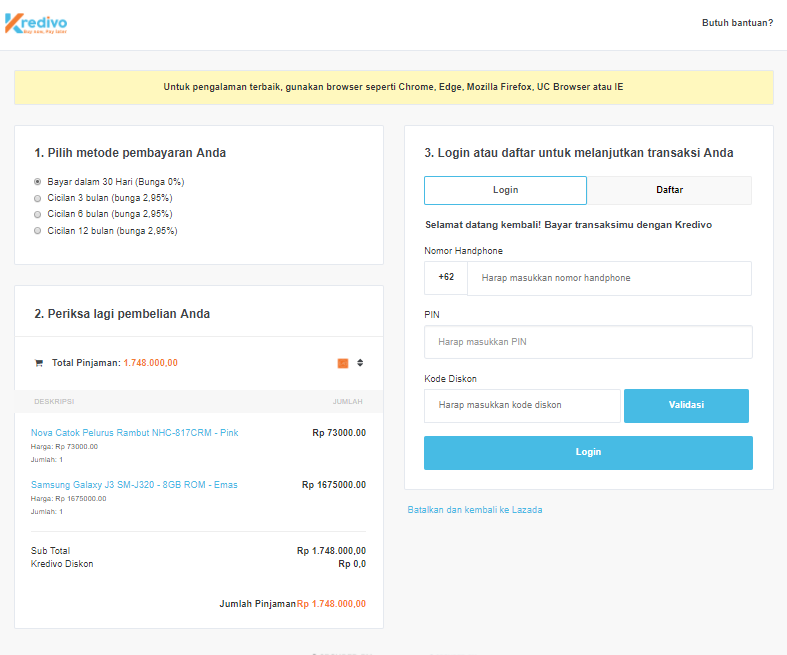 This Service Level Agreement (the “SLA”) is a policy governing the use of the Kredivo Checkout, a product of PT FinAccel Teknologi Indonesia (“FinAccel”) and its users (“you”). This SLA applies separately to each account using Kredivo Checkout or any other FinAccel products or services. FinAccel reserves the right to change the terms of this SLA. All of FinAccel’s products and services, including Kredivo Checkout, are hosted on Amazon EC2 and Amazon S3. FinAccel will use commercially reasonable efforts to make the Kredivo Checkout available with a Monthly Uptime Percentage (defined below) of at least 99.9% of the time in any calendar month. If it is not, then you may be eligible to receive the Service Discount described below. The following definitions shall apply to the Kredivo Checkout SLA. “Monthly Uptime Percentage” means the total number of minutes in the calendar month minus the number of minutes that the Kredivo Checkout server(s) was unavailable in the calendar month, divided by the total number of minutes in the calendar month. “Emergency Downtime” means those times where FinAccel becomes aware of a vulnerability which, based on a risk assessment of the vulnerability, FinAccel deems to require immediate remediation and, as a result, the Kredivo Checkout is made temporarily unavailable in order for FinAccel to address the vulnerability. Emergency Downtime is not considered to be a part of the calculation of the Monthly Uptime Percentage for purposes of this SLA. “Scheduled Downtime” means those times where FinAccel notifies you of periods of server unavailability three (3) days prior to the commencement of such a period. There will be no more than thirty (30) hours of Scheduled Downtime per calendar year. Scheduled Downtime is not considered to be a part of the calculation of the Monthly Uptime Percentage for purposes of this SLA. “Services” means the services provided to you by the Kredivo Checkout, including the transaction API and admin dashboard or alternatively, on terms as expressly agreed between you and FinAccel. One month Discount: Includes Thirty (30) days of discount from that month’s billing, if the Monthly Uptime Percentage for any calendar month is less than 95.0%. Maximum Service Discount: The aggregate maximum amount of Service Discount you can claim for a single calendar month shall not exceed thirty days of billing. Uptime SLA Exclusions: The SLA does not apply to any performance issues: (i) caused by factors outside of FinAccel’s reasonable control including any force majeure event or Internet access problems beyond the demarcation point of our servers; (ii) that resulted from any actions or inactions of you; or (iii) arising from our suspension and termination of your right to use Kredivo Checkout in accordance with the Kredivo Merchant Agreement. *These are response and resolution times between office hours (9 am – 6:30 pm). For response and resolution times on weekends and public holidays, please add another 30-60 minutes. Use credentials below to integrate with our sandbox server. Test Account To make transaction you can use below credentials and enter ‘4567’ as the OTP. Use credentials below to integrate with our production server. Only transaction comes to this server will be processed by our server. End Point Please ask support@kredivo.com for live server end point before going live.